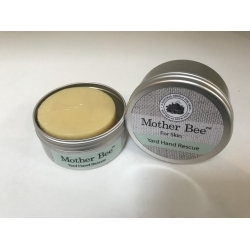 Mother Bee Yard Hand Rescue Cream / Bar in either a 30 Gram or 90 Gram Tin. The Mother Bee Yard Hand is ideal for soothing dry and chapped hands and can be used on cuts and sores. All horse owners and riders should have the Mother Bee Yard Hand Rescue in their bag or on the yard. Mother Bee Yard Hand Rescue Cream / Bar is a beautiful, exceptional type of hand cream made with ethically sourced beeswax. It's unique properties intensely moisturise your hands and leave them with a protective barrier that allows you to be in wet or cold conditions without harming your skin. Can be used on cuts and sores to heal and soothe. Remove the product from the tin to use. Ideal size to keep in your pocket or bag and a perfect gift for hard working hands.